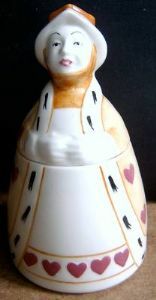 This very appealing lady appears rarely on the internet so this is a welcome chance to acquire this Queen Of Hearts Novelty Preserve Pot from CARLTON WARE. It was manufactured in the 1980s as a preserve pot in the 'Alice' range, itself quite a rare commodity. The Pot stands about 6.75 inches (17 cms) tall with a base diameter of 3.75 inches (9.5 cms) and is in excellent condition. She has a cream coloured base with shades of yellow, a cloak and bonnet adorned with dark red hearts, hence her title.